The biggest winner in Tuesday’s election was former City Councilman Carl DeMaio and his campaign to stop the gas tax hike. Tapping into serious discontent over the 12-cent per gallon tax hike, DeMaio spearheaded an impressive grassroots, online effort to repeal the hike approved last year by the Democratic-controlled Legislature. His strategy consists of three stages. Take out the deciding vote—in the one-vote margin gas tax win—Democratic State Sen. Josh Newman. This required enough signatures to force a recall election. That effort succeeded handsomely Tuesday night. Outspent by the Democrats by nearly 5 to 1, DeMaio’s team not only forced the recall, but also defeated the incumbent — making it only the sixth such successful recall in California in over 105 years. The consequences of that vote simultaneously deprived the Democrats of their Senate super majority. This part of DeMaio’s battle plan has also moved smartly into play with the submission of nearly 940,000 signatures to force a gas tax repeal initiative onto the November 2018 ballot and let the voters decide. Accomplished with lots of volunteer signature collectors (as well as paid gatherers), the effort far exceeded the 584,000 signatures needed to qualify. And it created a massive electoral database in the process. The massive surplus also prevented the need for any lengthy signature verification process—in the event of a challenge—that would have delayed the vote until 2020. 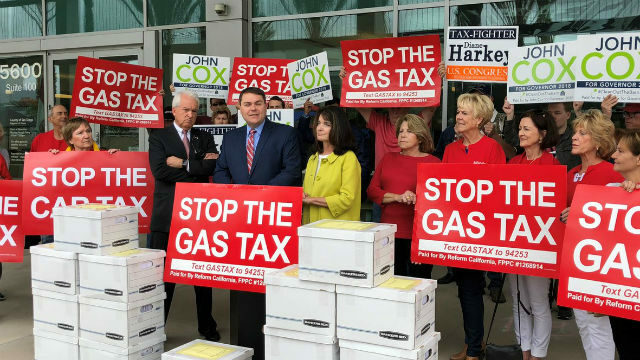 Recent polls suggest the actual vote in November to end the gas tax could provide another big win for DeMaio’s team and a trap door for Democratic candidates. A recent USC Dornsife/Los Angeles Times statewide poll found that 51 percent of California voters want to repeal increases to the state’s gas tax and vehicle fees. Only 38 percent support the tax. Those numbers are higher in Orange and San Diego counties and the Inland Empire, where 64 percent support a repeal. So that’s another probable statewide success for DeMaio. In addition, the stop the gas tax campaign will likely increase voter turnout, help the Republican base down ballot, and could become the defining issue this election cycle in California.